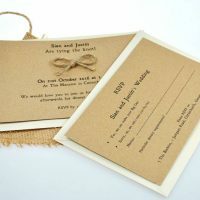 Categories: Wedding Invites & Stationery, Wedding Invitations. 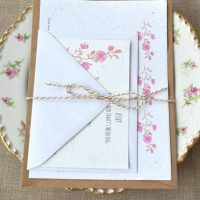 Let us design your wedding stationery for you! 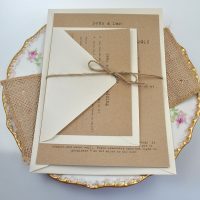 Our brilliant designer will create a thing of beauty for you to send out to invite friends and family to your wedding! If you also wish us to print for you, we can print on A5 or A6 recycled seed card or recycled card (Kraft manilla or white with petals here and there). If you would like us to print your design too, please order your card stock here and advise the order number for your design fee when you checkout. The design fee includes the invitation and the RSVP. Once we have your fee and design brief, we will get the proof over to you as soon as we can. If you are not having us print the invites we will also email the design files once the proof is approved. Please fill in your design brief above or email it to us after ordering, with your order number.